The Lost Fleet looks at the world of the Japanese-Canadian fishermen in BC and how deep-seated racism played a major role in the seizure, and sale, of Japanese-Canadian property and the internment of an entire people. This special event explores the legacy of these tragic events by considering the lessons that have been learned and how Canadian society has changed because of this experience. 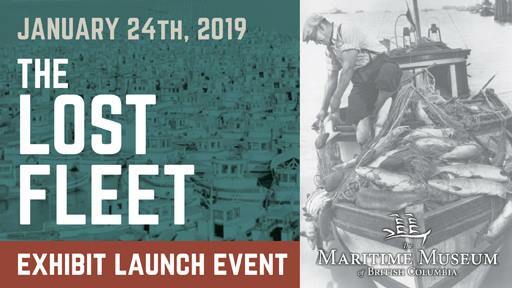 This launch event features speaker presentations from Dr. Jordan Stanger-Ross, Associate Professor at the University of Victoria and Project Director of the Landscapes of Injustice, Michael Abe, Project Manager of Landscapes of Injustice, Dr. David Suzuki, environmentalist with personal connection to the forced internment of Japanese-Canadians, and special guest, Marlene Howell, the Maritime Museum of BC Artist-in-Residence (January to March, 2019). This exhibit is on loan from the Vancouver Maritime Museum.